The objective when identifying an interim manager is to ensure that he or she will be able to meet your organizational needs and goals. Therefore, the process of identifying the ideal candidate is critical to achieving a successful outcome for any interim management engagement. 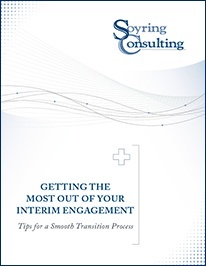 Identifying a candidate who can meet your interim management needs is only the beginning of achieving successful outcomes from the engagement. Following candidate selection, it is critical to help build a solid foundation for your interim manager’s success. Not only will this foundation benefit your interim manager by creating a smooth integration process—it will also allow him or her to meet your organizational needs and goals in the shortest time frame.